Stats show we spend $111 a month on "product." 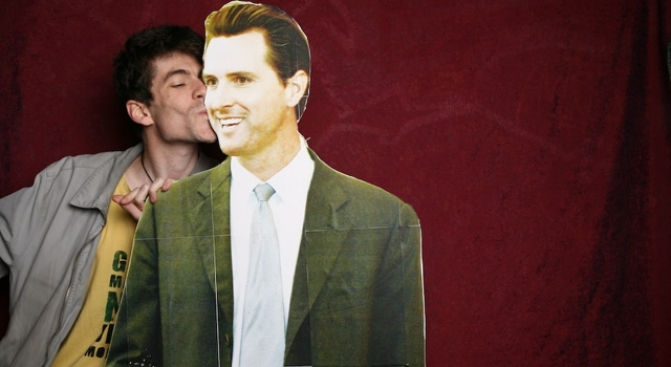 Mayor Gavin Newsom poses with a fan. The Daily Beast thinks it has found a way to see which areas of the country are the most hung up on appearances. And while most Californians would immediately assume Los Angeles is the gold standard when it comes to who is the most vain, Southern California didn't even get a bronze in this list. The San Francisco Bay area is the most vain spot in the country according to publication. The City is followed quickly behind by New York and Boston. Los Angeles came in No. 4. The Daily Beast explains it took into account our weight, our gym cards and our love for "product." First, it took the top 25 cities with the largest percentage of people who belong to gyms. Then it took that list and measured BMI (body mass indicator) stats from the health department. That list was then measured based on how much people spend on personal care. The cosmetic budget got double the points and from the below numbers you can see that is what puts us on top. No. 8 - Charlotte, N.C.
No. 11 - Nashville, Tenn.
No. 14 - Raleigh, N.C.
No. 17 - Buffalo, N.Y.
No. 20 - Orlando, Fla.